With statements from Valeo, Bosch and Bishop Consulting, here is a video that explains why CESA 2014 was the place to be to discuss the future of automotive electronics. He was one of the speakers in the first round table of the congress, dedicated to worldwide market. 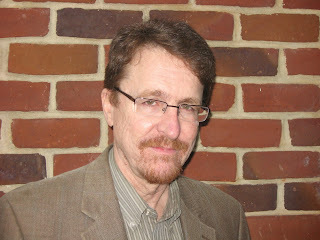 Richard Bishop is Principal at Bishop Consulting and one of the top experts in the US, in the field of autonomous vehicles. Involved in many working groups, Mr Bishop took time to meet people at the congress and gave us an interview. He's impressed by what's going on in Europe to bring those cars to the market. It was one of the highlights of the exhibition during last CESA. PSA showcased its Car Easy Apps plateform, enabling software developers to bring apps to the car in a secure way and for driving purposes. 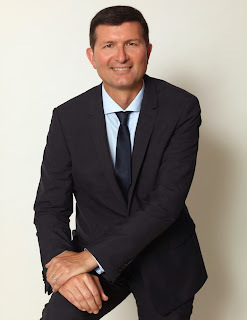 The Manager of the connected vehicle and EE systems for PSA Peugeot Citroen, El Khamis Kadiri, was one of the speakers of the congres. He participated to a panel session on the connected car. He also gave us an interview. As you know, autonomous driving was really the hot topic at CESA 3.0. During the congress, we made interviews with Christian Sobottka, Executive Vice President Sales/Marketing at Robert Bosch and Jean-François Tarabbia, Group R&D and Product Marketing Senior Vice-President at Valeo. These two executives give their vision for CESA's blog. So that, we have insights from what's going on in Germany and France. During the CESA, the Deputy Chief of Mission of the German Embassy in France, Detlef Weigel, came for a speech and visited the exhibition. You can see him on this picture (on the left) listening to Jean-Luc Maté from Continental Automotive France (member of the advisory committee of the event). In his speech, closing the day 1 of the congress, M. Weigel made some statements, highlighting the importance of the automotive industry for Germany and France. He also said that a strong cooperation, on governmental level between the two countries was in order to boost the industry. For instance, there has been a recent creation of a specific investment effort on both sides of the Rhine to boost innovation, in particular in the area of key technologies, batteries and autonomous driving. The DCM of the German Embassy in France welcomed CESA as a great initiative to bring both countries again closer together. 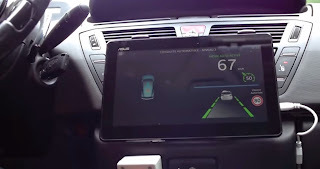 As we said already yesterday, the connected car and autonomous driving were really the two major trends at the CESA 3.0. These trends have been adressed in different ways, from a technical side but also from a HMI perspective. This morning, a round table was organized to discuss human factors. It was one of the most interestinf of the event. 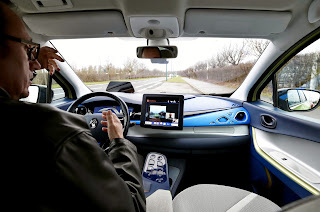 Experts from OEMs (Renault),l Tier 1 suppliers (Continental, Visteon), labs (LAB, IFSTTAR) and even aeronautics (Thales Avionics) commented how they were trying to keep driver's attention focused on the road. The conclusion is : one HMI doesn't fit for all situations. This is the D-day for CESA 3.0 congress. Located at the Beffroi de Montrouge, in the south of Paris, this event on automotive electronics, organized by the SIA, welcomes top experts during two days. Main topics to be dicussed are the connected car and autonomous driving. But technical sessions and round tables will mention as well CO2 reduction, technical progress in ADAS, HMI integration, as simulation, testing and validation. French autonomous vehicle plan : a reference in Europe ? CESA 3.0 congress will be the opportunity for all the foreign visitors to discover the french autonomous vehicle plan. It's one of the 34 national plans defined by the governement, covering several aspects of the industry (aeronautics, factory of the future, energy storage...) with the aim to conquer new market shares on the international market and to create new jobs. The autonomous vehicle is one of the top priorities. The plan is coordinated by Renault, with Carlos Ghosn as a project leader. EuroNCAP has enhanced its assessment procedure by adding test scenarios that require the use of ADAS. After having analysed more than 5 million accidents, IIHS is reporting that 23% of fatalities can be avoided by lane warning system and 8% of fatalities can be avoided by adaptive headlight systems. The challenge now for the supply chain in automotive is to provide the ADAS systems that meet EuroNCAP requirements. Radar and Camera are the key technologies to be used here and depending on the car segment, different configurations can be identified. As you may already know, autonomous driving will be one of the major highlights of our congress, in early december in Paris. There will be for instance a panel session dedicated to the new usage of cars with automation, on the 3rd in the afternoon. 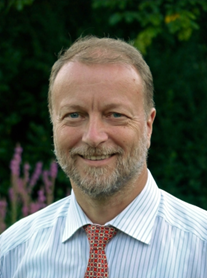 During this session, CESA 3.0 will welcome a presentation made by a french lawyer, Yvon Martinet from DS Avocats*. He's an expert in the field of autonomous driving and is working closely with the french institute VeDeCoM on legal aspects. Mr Martinet will make an update on the regulation, both in the USA and in Europe, where several countries have decided to propose admendments to the Vienna convention. The french lawyer will participate as well to the panel and will answer to all questions regarding legal aspects and responsibility in case of failure. If you're interested in autonomous cars and want to learn some more on regulation evolution, don't hesitate : register and come to CESA 3.0 congress ! CESA 3.0 bonus : the draft from a exclusive report "Photonics in Automotive" available for commenting ! 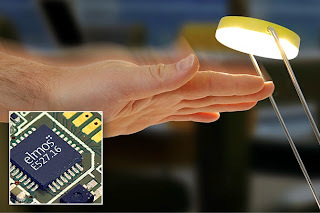 This a nice initiative from EPIC (European Photonics Industry Consortium). 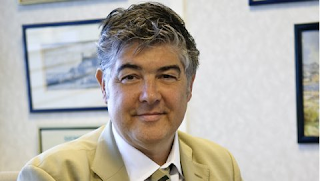 Carlos Lee, Director General, who will be a speaker in the panel session "key technbologies for modern cars", wants to share with the community of CESA 3.0 a brochure titled “Photonics in Automotive”. The purpose is to offer an overview of the photonics technologies relevant to the automotive industry, it is meant as an informative brochure that is easy to read, and will encourage the automotive industry to engage more with the suppliers of photonic technologies. Fitted on the new Mondeo, Ford’s new Pre-Collision Assist with Pedestrian Detection can detect people in or near the road ahead, or who may cross the vehicle’s path. 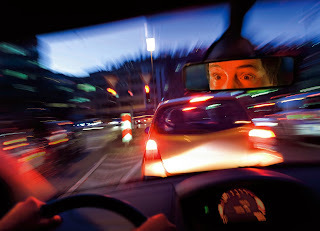 The system processes information collected from a windshield-mounted camera, and a radar located in the bumper, and checks it against a database of “pedestrian shapes” to help distinguish people from typical roadside scenery and objects. 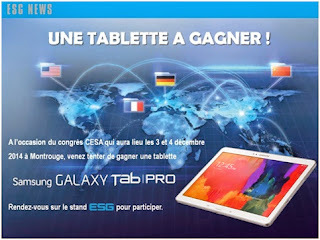 A tablet PC to win from CESA 3.0 partner ESG ! ESG is one of the partners of CESA 3.0. The company, which is involved in the organization comittee, will showcase its innovations. The company will have two speakers during the event, including Jörg Klauck, manager o the technical cluster « Test & Integration » and Thierry Bouqier, in charge of embedded software activities. ESG will also have a booth in the exhibition space. We recomend you to stop by, not only to discover the latest innovations, but also because there is a Galaxy Tab Pro tablet PC to win. The only condition is to let your business card during your visit. As the drive to realize V2X communications - Vehicle-to-Vehicle (V2V) and Vehicle-to-Infrastructure (V2I) - gathers pace, STMicroelectronics and Israel-based Autotalks (a V2X-chipset market pioneer and leader in the first wave of V2X deployments), have announced that they are cooperating to deliver a mass market-optimized V2X chipset for widespread deployment by 2017. Both partners will discuss that point during CESA 3.0 in Paris. The CESA congress, in partnership with the PRE agency, is delighted to invite our foreign visitors to participate to a VIP Business Tour, on December 2nd. The tour will begin by a meeting at STMicroelectronics headquarters, in Paris. Then, our guests will have a fantastic opportunity to visit the Renault Technocentre, one of the most emblematic & innovative automotive sites in the Paris Region. This research center is working on autonomous vehicles and multimedia systems. 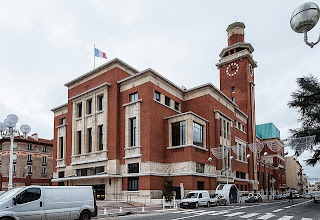 A VIP networking buffet will be organized at the CESA exhibition center (Beffroi de Montrouge, in the south of Paris) at the end of the tour. MINES ParisTech, France’s leading academic institution by volume of contractual research, today announces the creation of an international automotive research chair in partnership with manufacturers Valeo, PSA Peugeot Citroën and Safran. Baptized “Automated Vehicles- Drive for You”, the chair will unite researchers from MINES ParisTech's Robotics Centre with teams from international partner institutions — Shanghai Jiao Tong University in China, the University of California, Berkeley in the United States and Ecole Polytechnique Fédérale de Lausanne in Switzerland. - Develop intelligent onboard systems. 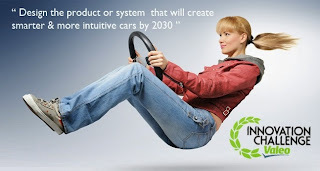 - Get self-driving vehicles on the road in Asia, Europe and the United States. 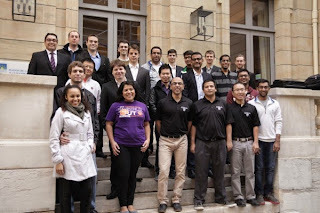 In one month, CESA 3.0 will be held in the south of Paris. This unique and international event will bring together more than 400 participants (directors, managers, heads of department, engineers, researchers and technicians). An exceptional line-up of guests and speakers will be present for the occasion. Would you be interested to be a sponsor of the event ? Some advertising and sponsoring packages are still available, but you should hurry. Companies such as AVL, Continental Automotive, Infineon, STMicroelectronics, TE Connectivity and Vector are partners of the event. Great names of automotive industry have also booked to be in the exhibition space, including PSA Peugeot Citroën, Renault, Continental, ST, Valeo Vector, AVL, Bertrandt, ESG, IAV, Mentor Graphics, TE Connectivity, HRS (Hirose Electric Europe), Serma Technologies, Verifysoft Technology, Tyco, Qtronic, IPG and two french clusters (Mov'éo and Automotech). 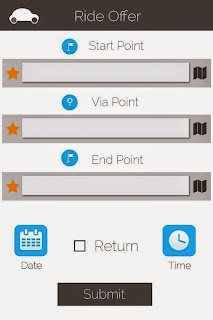 Designed by PSA, Car Easy Apps is a software platform enabling software publishers to design an ecosystem of smartphone apps that can interact in complete security with vehicles and bring motorists all-new services. The application programming interface (API) enables independent developers to design apps compatible with all mobile handset operating systems (iOS, Android, BlackBerry, Windows Phone). It also includes a simulator for testing the compatibility of the apps with vehicles and reproducing on-road driving conditions. Today’s Automotive industry is vastly aligned on the premises that current society’s evolution on ways to communicate, manage data, and interact with intelligent objects is going to define the future vehicle – life on board - services and the corresponding interior’s performance value. In fact, synchronized with the technological evolution, the way how population establishes relations between among intelligent objects (nomadic devices and home appliance, vehicle, etc.) is changing extremely fast towards extensive “self” concept and setting basis for new era of customer satisfaction requirements. Aging and Youngers car users of today are getting used , in the aside connected world of the car, to customized propositions, that allow multitasking, that provides them an Eco systemic functionality always available, symbiotic and interactive, a life companion (quantified self) that cares about. A few weeks ago, during ITS world congress in Detroit, Honda has unveiled a new concept called V2V "Virtual Tow"? 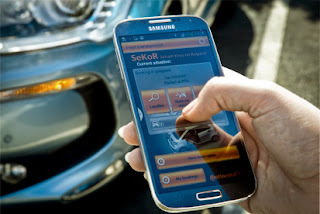 It utilizes connected car technology to empower a driver to assist another driver in distress. 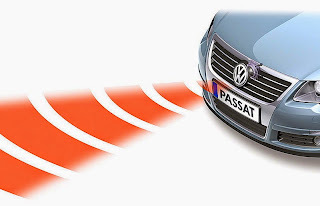 The driver in need of assistance is able to alert surrounding vehicles to the need for assistance, at which point an assisting driver can virtually link up and "tow" the vehicle - with the trailing vehicle taking its driving cues from the lead vehicle via connected-car (V2V) technology and automated system. Then, it's possible to bring the driver in need for assistance- to a location where the driver can receive emergency services, such as a hospital. Launched by Valeo in September 2013, the Valeo Innovation Challenge is a global contest open to engineering students around the world, invited to play an active role in automotive innovation by designing the product or system that will create smarter, more intuitive cars by 2030. Nearly 1,000 teams from 55 countries signed up for the first edition. Only 20 have been shortlisted. At the 2014 Paris Motorshow, Valeo will reveal the names of the winners. But also, the OEM supplier will announce the terms and conditions of this year’s contest. 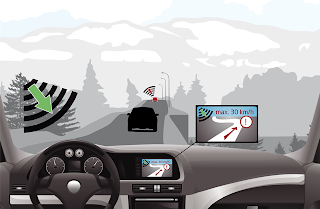 Collision warning applications are object of several research programs for active safety systems development. The vehicle traffic increment in IDIADA Proving Grounds’ High Speed Track forces to increase the system safety to provide a harmless scenario for its users. 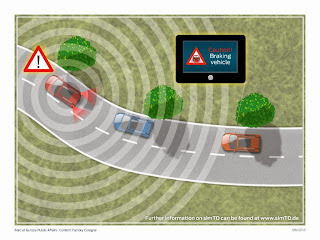 As Collision Warning Application is one of the most demanded safety technologies within our daily activities, it is important to consider the application flexibility in order to adapt the algorithm to different types of tracks, and not only on our proving ground tracks, but also in urban and interurban roads. In 2011, rear end collision, traffic jam, and multiple accidents caused 22,11 % (191) deaths in moving vehicles scenarios. 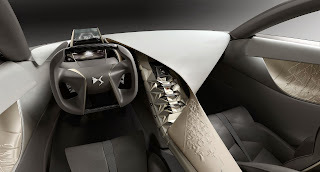 PSA will unveil at Paris motor show a vision of the future for the DS brand, combining sophistication with advanced technology. For instance, the cabin of Divine DS showcases its in-car technologies, with a cockpit driving position featuring an array of digital functions. First, the controls of Divine DS are grouped on a HD Touch Drive interface with a spectacular 10.4 inch screen. Located on the overhead console, this multifunction screen frees up space on the dashboard and includes a function that replaces the rear-view mirror. Driver information is in digital form, with a head-up display above the steering wheel showing essential driving information. This panel is completed by a holographic display behind the steering wheel – complete with a 3D readout that lets the driver view navigation information, for example, without taking their eyes off the road. The city car from Renault will be one of the highlitghts of the Paris Motor Show (Mondial de l'Automobile) this autumn. Despite it's a small and entry level car, the french brand has decided to add some high-tech features. For instance, the new Twingo will offer a lane departure warning system based on a camera. A first for that range of cars. 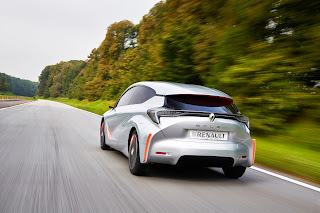 Renault has integrated as well a back up camera and a hill start assist. 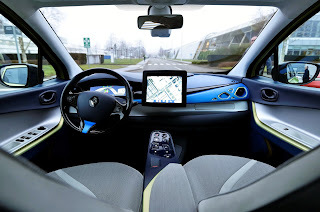 Last but not least, the New Twingo will be connected : either by the R-Link in-dash touch screen tablet (with connected services and apps), or a smartphone based navigation (including eco driving assist). The paper is a summary of discussions that have taken place in a working group of the ZVEI* with participation of major automotive semiconductor companies (ST, Freescale, Infineon). In the automotive sector , the desire to be able to quickly and fully benefit from developments in the consumer sector is growing. This is especially true for functions that rely on developments and services from the telephone and Internet sector. In this contribution we will show what the minimum requirements must be met for the automotive sector for components in all future functions for autonomous driving. Quality management is an important issue. 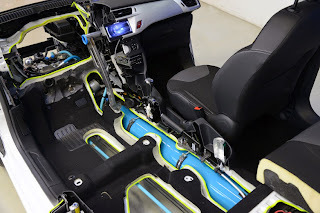 In addition, since safety-critical functions are affected in the car, it is necessary, to comply with the requirements for functional safety ( eg ISO26262 ). Default probabilities and life of components and information storage are different and must be considered very carefully. Cadillac will begin offering advanced “intelligent and connected” vehicle technologies on certain 2017 model year vehicles, General Motors CEO Mary Barra said during her keynote address at the Intelligent Transport System (ITS) World Congress in Detroit. In about two years, an all-new 2017 Cadillac vehicle will offer customers an advanced driver assist technology called Super Cruise and in the same timeframe the 2017 Cadillac CTS will be enabled with vehicle-to-vehicle (V2V) communication technology. Super Cruise, the working name for GM’s automated driving technology, will offer customers a new type of driving experience that includes hands-off lane following, braking and speed control in certain highway driving conditions. The system is designed to increase the comfort of an attentive driver on freeways, both in bumper-to-bumper traffic and on long road trips. 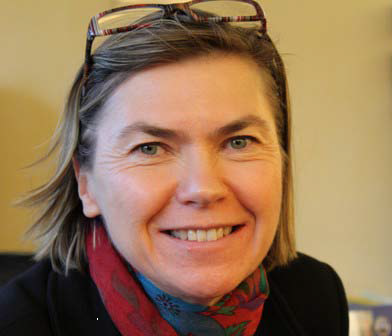 Head of french LAB (Laboratoire d’Accidentologie, de Biomécanique et d’analyse du comportement humain), that stands for accident research, biomachanical and driver behaviour laboratory, Anne Guillaume explains how her team works to improve road safety. Can you please remind us what is the LAB ? It's a common structure to the french OEMs, created in 1969 when France was facing a very high rate of fatalities (more than 14 000 people killed on the roads). Renault and Peugeot joined their efforts to have a better undestanding of accidents and to develop new safety features. It's been successful, if you consider that fatalities came down to 3 268 in 2013, meanwhile road traffic was multiplied by three. Historically, you've been focused on secondary safety. Right ? 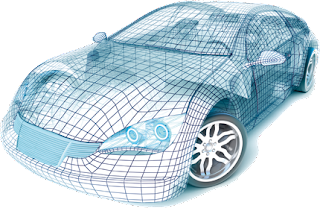 Electronics have resulted in major advances in the automotive sector in the past 15 years. 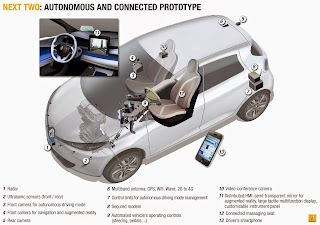 And with the emergence of the Internet of things, there is now an entirely new development –the connected car. 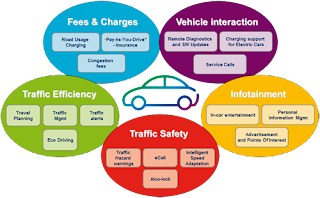 The car collects and analyzes vast volumes of data and shares it with other vehicles (“car-to-car”) or with the infrastructure (“car-to-infrastructure”). This allows vehicles to build up a dynamic model of their environment. 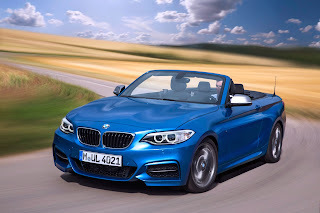 The car learns more about the current traffic situation than the driver is able to, resulting in entirely new opportunities for additional active safety, comfort, and eco-friendliness. 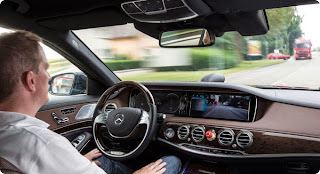 The new possibilities offered by the connected car lead to the vision of a self-driving car which is able to negotiate even complex traffic situations both independently and safely. Incorporating the vehicle into the Internet of things results in entirely new challenges that are to a large extent familiar from the networked digital consumer world. 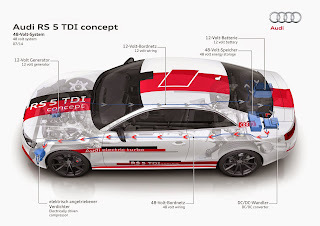 Audi recently showcased the scope of the 48‑volt electrical system with the technology demonstrators A6 TDI concept and RS 5 TDI concept. Both models are fitted with an electrically powered compressor. This operates independently of the engine load and therefore fundamentally improves the acceleration performance. 48‑volt technology is moreover ideal for realizing convenience systems for dynamic chassis control. Audi will shortly be unveiling a variety of applications in this field. The current state of the art technology has taken 12‑volt electrical systems to their very limits. Especially at low temperatures, all the various static‑load consumers can account for the entire power generated by the alternator, which can deliver up to three kilowatts. The battery power is no longer capable of meeting the demands of new dynamic‑load consumers, such as high‑performance electric compressors. 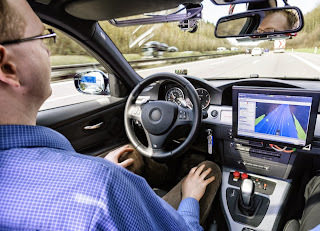 Highly automated driving is one of the current challenges in the automotive industry. Driven by legal regulation as well as committees like EuroNCAP current and future vehicles are equipped with camera, radar, ultrasonic and laser sensors to fulfill the requested customer and safety contents. Contrary to this, current highly automated driving projects mostly use sensors and measurement equipment (e.g. 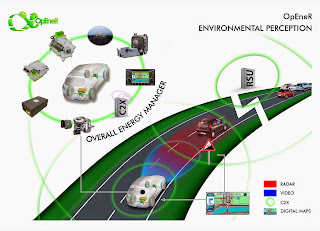 Differential GPS and initial measurement platform) or 360° Laserscanners with low capabilities to be integrated in series vehicles due to the facts of high costs or installation requirements. Ford Motor Company participated in a special test of a high-tech early warning “brake light” that can warn drivers following behind even if they are around a bend or behind other traffic. It was during the simTD (Safe Intelligent Mobility – Testfield Germany), a four-year joint industry research project in Germany. 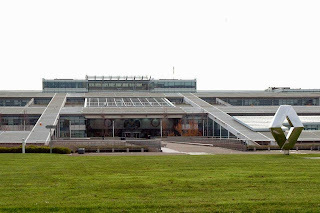 Engineers from Ford’s European Research Centre in Aachen, led the development, testing and data analysis. In emergency braking situations, the experimental “Electronic Brake Light” transmits a wireless signal to illuminate a dashboard light in cars following behind. The study found the technology could enable drivers following behind to brake earlier and potentially mitigate or avoid a collision. 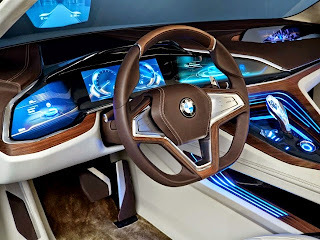 In the world of Internet of Things, the car is becoming rapidly one of the main connected element in our every day’s life. Our research topic deals more specifically with drivers who connect their smartphones to carpool with strangers. In fact, smartphones are able to communicate crucial data for eco-mobility, such as the number of “empty seats travelling” (Nokia Research, 2009), available for potential passengers. Thanks to the GPS, 3/4G networks and “dynamic carpooling” applications, the car stands out as the new “public-private” transport. Continental is presenting a new evolutionary stage of its head-up display (HUD). 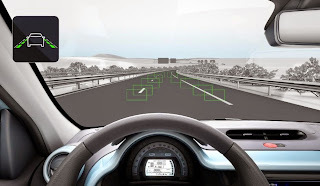 The Augmented Reality HUD supplements the exterior view of the traffic conditions in front of the vehicle with virtual information (augmentations) for the driver. 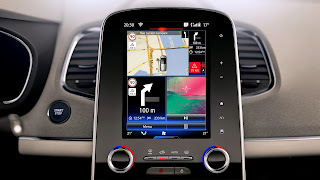 The AR-HUD was developed from the previous HUD, but now the reflected information appears exactly where the information becomes a part of the driving situation. When navigating, for example, a virtual symbol inserted precisely into the exterior view shows the driver the way on the curve in front of the vehicle. 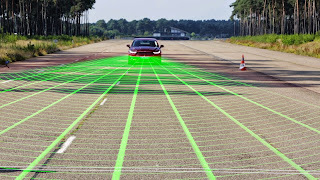 When distance controls (Adaptive Cruise Control, ACC) are enabled, a marking in the AR-HUD visualizes which vehicle in front is detected by the assistance system. 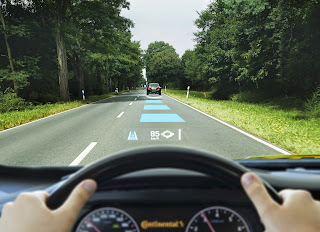 Continental is planning production readiness of an Augmented Reality Head-up Display in 2017. V2X communication is making its way to series-production, fulfilling the vision of zero-fatalities safety and lower emissions enhanced mobility. However, the technology value is heavily dependent on penetration rate acceleration, which can only be achieved by applying built-to-cost solutions that can be quickly introduced to market. Following experience gained from several design cycles, Autotalks obtained a deep understanding of the contributors to high system cost. The contributors will be presented, as well as the methods to eliminate those. Applying all the considerations will yield a cost-optimized system that can be easily adapted to any specific use-case. Quick introduction is a factor of development and testing time and risk. 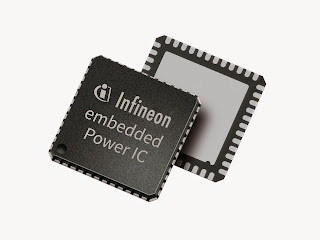 Pre-integrated software, elaborated hardware reference design, mature solution and engineering support can shorten significantly the schedule and minimize the risk. An example of quick design cycle will be analyzed. During the final review of the European research project OpEneR*, last July in Vigo, Spain, Bosch and PSA presented collaboratively developed driving strategies and driver assistance systems that will significantly improve the efficiency and safety of both electric and hybrid vehicles in the future. The aim was to increase driving range without enlarging the battery. 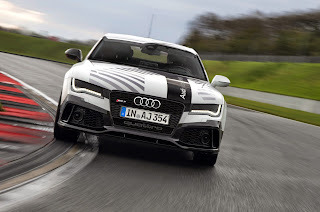 Engineers and researchers have worked to improve the electrical powertrain, the regenerative braking system, the navigation system, and the surround sensors, as well as on functions that connect these elements with each other. One task was the development of “eco routing”. Thanks to the navigation system, that continuously takes in account the car's real energy consumption, test drives demonstrated energy consumption savings of up to 30 percent in return for a longer travel time of just 14 percent. P2P carsharing : the future of the autonomous vehicle ? According to Techneo, a consulting company that conducted a survey for Deways, one of the french peer to peer carsharing providers, the autonomous vehicle will not be a substitute to the personal car. But, it may be a competitor for taxis and private chauffeurs. The survey argues that an automated vehicle would be much more easy to operate, for P2P carsharing. The car would be able to go by itself and to meet customers that would like to rent it. A conventional car stays 90 % of the time parked. So, just imagine how it would be more flexible - and more profitable too - to rent it when it"s automated. Techneo determined several profiles of the autonomous vehicle. For example, the personal one, the family one, the shared one and the delivery one. The conclusion is that the future of the autonomous vehicle belong to carsharing, wether the vehicle be partially or totally shared.